It’s time for little ghouls and goblins to dress up, sugar up, and have a rocking Halloween party. 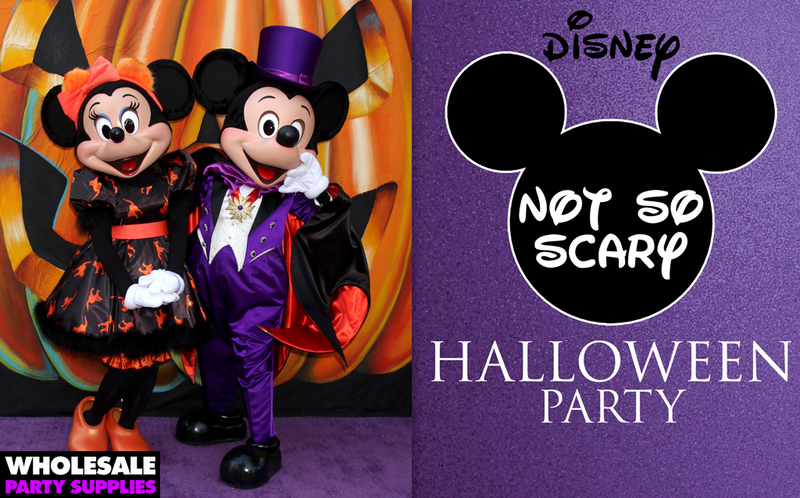 It can be a challenge to hit the mark without going too scary, but this party guide has all the tips you need to have a frighteningly awesome Disney Halloween party. When you think of a Halloween party, the first thing you think of is décor. Décor is absolutely essential to a Halloween party, and it takes some creative thinking not to get into the “too scary” realm. Monsters Inc. is full of friendly monsters. Our Disney Monster game can double as decoration. Before the party hang the eyes in varying lengths in a doorway and let guests grab them when the games begin. Take a green balloon, along with green streamers and construction paper, to make a fantastic Mike Wizowski! Print out a Disney character and carve it into a pumpkin. Better yet, cut out two round cardboard circles. Use a marker or craft paint to paint the circles black, and tape a wooden skewer on the back. Carve Mickey’s face into the pumpkin, and insert the ears on the sides – voila! Mickey mouse pumpkin. 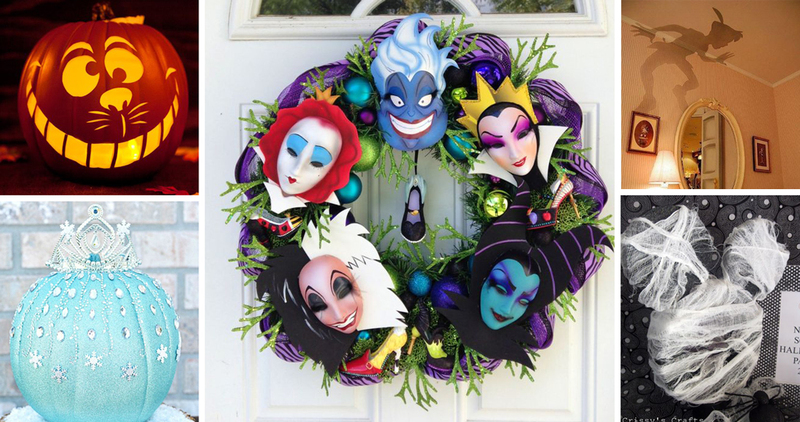 Represent the Disney Villians with purple, black, and green streamers for Maleficient or Ursula, Black, white and red for Cruella. Find pictures online of your favorite villain and print them as photo props- just attach a stick. Take, for instance, hands. Grab some white felt and a sharpie, print out a template and create some mickey hands. These can be hung, or you can make a garland out of them by gluing them to ribbon or sewing through them with fishing line. There are many free fonts available that are Disney themed. Download a few, and use them to make spooky signs for your home, as well as personalizing other items. Print out the words you’d like to use, like, such as “Sarah’s Spooky Shindig” or “Mickey’s Mystery Mansion” and cut them out. Trace them onto a piece of wood, and paint them. Nail a paint stick on the back, or another piece of wood, and you’ve got a fantastic sign. While you’re at it, think of some other ways to intertwine spooky Disney lines into your party. “Poor, unfortunate souls” or “We’re all mad here” are some great ones. If your party is thrown in honor of a boy or girl, be sure to intertwine that into not only the invitation, but the party, as well. Make food tent labels with your child’s name and chosen party theme, like “Annabelle’s Awesome Halloween Party”, or “Sarah’s Slimy Snacks”. Making your own labels, for things like lollipops, is simpler than ever, since you can buy many different shapes of labels at an office supply store – or have us them print them out for you! Order a personalized banner to hang over a doorway. No Halloween party is complete without some spooky foods. With so many fantastic characters to choose from, the opportunities are endless! A favorite of the Evil Queen, Candy apples are a great party food, and you can make them in any color. If you’re serving a crowd, dyed spaghetti, meat sauce, and green olive eyes is a great way to make a spooky treat! If you’re looking for some healthy food to combat the junk, how about some mandarin orange pumpkins. And string cheese, pretzels, and chives make fantastic Sorcerer’s Apprentice brooms. For drinks make a bubbling brew. Take a 2-liter of soda, a jug of Hawaiian punch/juice (your desired color), add a scoop of ice cream, and sprinkles for a spooky, frothy drink. Minions are make for great party food inspiration. Mix together some muddy buddies, pretzels, yellow/blue M&Ms, and edible icing eyes, and you’ve got yourself a Minion Munch Mix! Additionally, fill a cylindrical container with yellow candies, and make minion goggles out of construction paper, and tape on, for another great treat! No Halloween party is complete without some fun games. While tag and hide-and-go-seek are fun, it may be too cold/rainy to be able to go outside, so have a few games on stand-by, just in case. Bobbing for apples is always fun, and to make things simpler, you can use fake apples that can be traded or decorated once retrieved. Try pin the ears on Mickey, or pin the crown on the villain. There are many Disney games on our site, or you can make your own! Disney bingo is a great option – and you can play music from the movies and have the kids guess which movie it’s from before marking it off on their card. With a few straight stitches and beans, you can make some villan-colored beanbags. Paint the villian on a piece of plywood, cut holes in different areas, and have a great bag-toss. You could also hold a hula-hoop with streamers attached, and have the kids toss them through the hula-hoop. 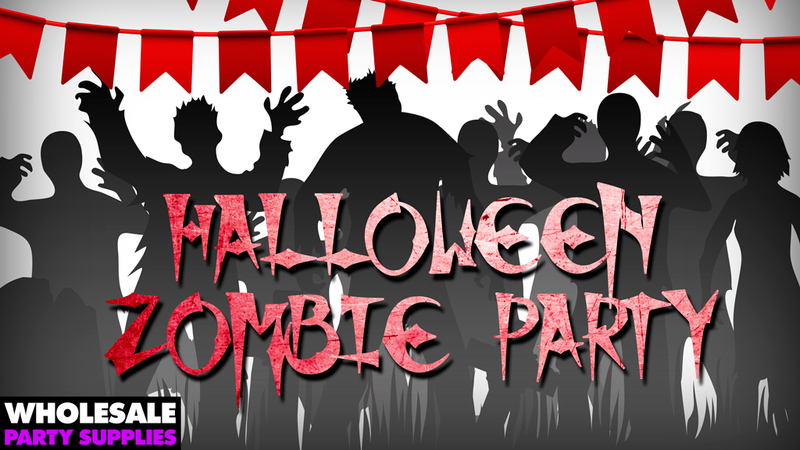 Halloween parties can be crazy, so it’s up to you to keep the party contained with some fun entertainment. What’s a Disney Halloween party without some great Disney music? Download some soundtracks, or play the movie of your choice softly in the background. Since it’s Halloween, you could tell a not-so-scary Halloween story as a character from a Disney movie, such as Maleficient or Gaston. Set the kids up with some crowns, jewels, and glitter glue to make their own crowns like Elsa, Cinderella, or Ariel. If you have the space, set up a photobooth with masks and other props for the kids to use, and have someone standing by to snap the action. Party favors are a huge part of any great party, and Halloween gives you a great opportunity to make your party shine. Decorate the outside of a favor box with glitter glue, character stickers, or personalized labels. You can use one of our favor kits, or make your own. For instance, get some bubbles in yellow containers, and make minion eyes – or green bubbles, and a Mike Wizowski eye. Take a fake apple, cut a slit in it, and slide in a thank you note for a Sleeping Beauty themed item. Disney character Pez dispensers are a great idea, just be sure to include the candy!